I'm sending the Happiest of Birthday wishes to my Daddy! My parents don't make too much of an appearance on the blog(per their request) but I didn't want to let the day go without sending those wishes! He is just the best Daddy a girl could ever have. He has shown Sister and me the example of true love and what we deserve in a husband. His love and devotion to our Mother is nothing short of incredible! He loves those Auburn Tigers! 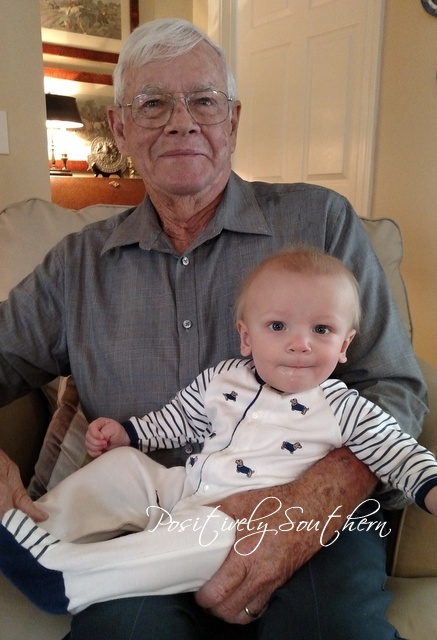 Here he is with the only Great Grandbaby, Ethan! To my boys he is Papa, they called him this morning before they left the house and sang to him! Ya'll precious doesn't describe! For me this man can fix anything, diagnose any kinda of car problem over the phone with 99% accuracy, put up blinds in almost every house we've owned, bestowed his love of WW2 movies on me, as well as all animals large and small and I get my love of Mexican food...aka tacos from him!!! What a lucky girl you are. Happy birthday Papa and many more! Great words. You are a lucky girl indeed.